Here was a combination that simultaneously sounded bizarre and genius. 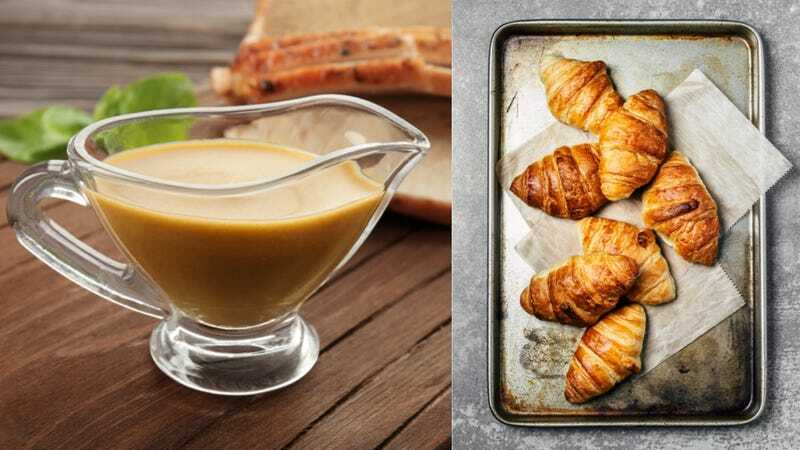 It made perfect sense: Bread is a natural thickener, and the high butter content in croissant felt like a natural incorporated into gravy. So we called back, and graciously, Izard provided The Takeout with her recipe for croissant gravy. That was such a nice move, we’re going to plug her book again: Gather & Graze: 120 Favorite Recipes For Tasty Good Times. You should get it. Begin with roasting turkey neck at 350 degrees Fahrenheit for 15-20 minutes or until brown. While neck is roasting, sauté the gizzard in a sauce pot, and remove once browned. Sauté the onions, fennel and carrots in the sauce pot with a little bit of oil for 10 minutes or until soft. Add the tomato paste and coat the vegetables stirring with a spoon. Once coated, add the wine and reduce. Once most of the wine is reduced, add the chicken stock, turkey neck, and gizzard. Bring up to a boil, then lower heat and reduce the liquid by half. After reducing, strain the stock and return to the stove top. Place the croissants into the sauce pot and cook until they have absorbed some of the liquid. Put into a blender and buzz croissants and chicken stock. Season with salt. If you desire a thicker gravy, place back on stove and reduce a bit more.